Now you can download your EPF e-passbook online. This facility available on EPFO ( Employee's Provident Fund Organisation ) Website. 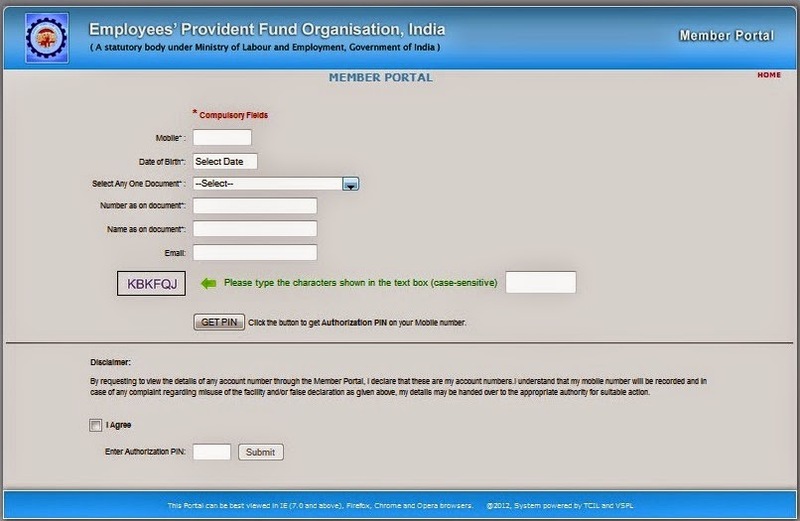 EPFO has lunched the e-passbook facility for EPF subscribers which will include their updated PF account status online. The new concept called EPF account passbook allows members to download their e-passbook multiple times in a month. What is an e-passbook ? E-passbook is an online version of the EPF status book, where employees PF status and transactions are recorded and can be tracked.Month and date wise, all the transitions made in the account are displayed in the e--passbook. it will also include additional details such as name, and date of birth of the employee. E-passbook will be available for active members only, no passbook shall be available for settled, in operative or negative balance accounts, No passbook will be available for exempted establishments. To avail the e-passbook facility subscribers need to register themselves on the EPFO official Website and provide all the necessary details. Fill up the following details. Click on the "GET PIN"
You will receive an Email , verify yourself by clicking on the given link. Now your Registration is Completed. How to download e-Passbook ? You can log in With your document and mobile no.